Minimum order is 50 coolies. Pricing as low as $0.70 each. For those customers that like a slip on bottle type koozie, this one is for you. These are offered in a wide variety of colors, with your choice of sleeve color and also various imprint colors. 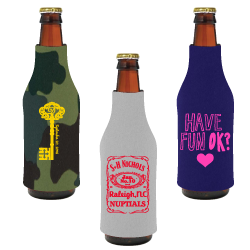 Your purchase of slip on bottle koozies to fit a standard long neck bottles are made from 1/8 inch scuba foam material and will keep drinks refreshingly cool. 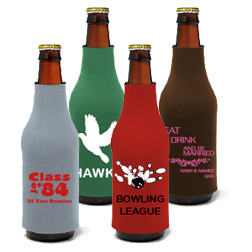 Our slip-on bottle koozies go on fast without the frustration of a zipper and have no bottom. Prices include a one-color imprint on one or two sides. * Must be between 0 and 255 characters. I uploaded my own art. This includes setup, proof & shipping. There are no hidden costs. Happy with your choices? Order and we’ll email a proof shortly!